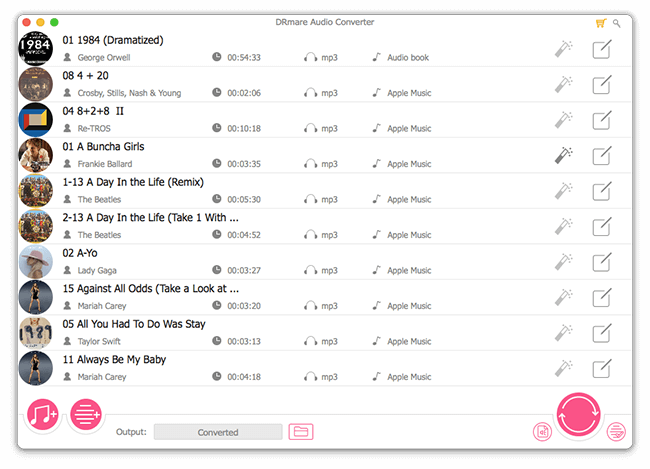 DRmare Audio Converter for Mac enables you to remove DRM from protected Apple Music, iTunes songs and Audible audiobooks, customize the output audio format and quality, organize album tag info and so on. 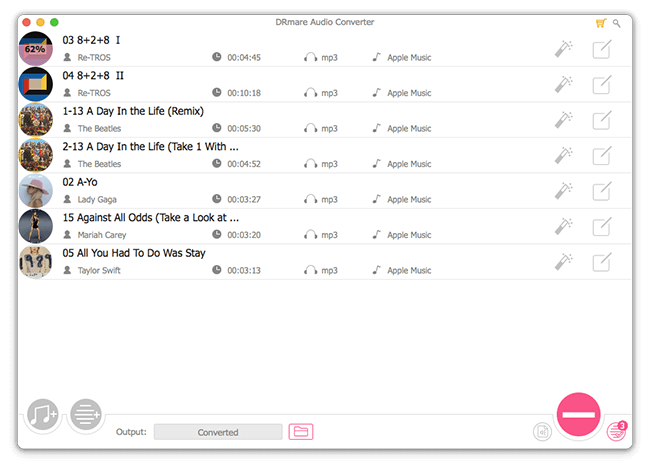 Within just a few clicks, you can regain the full control over any audio you've collected. 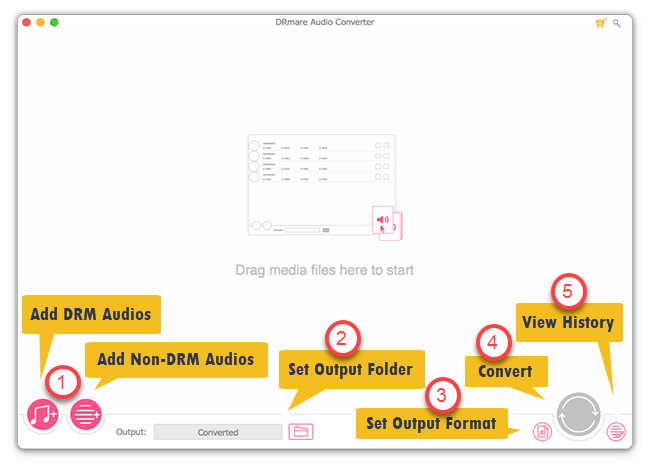 The following is the guide on how to convert DRM and DRM-free audios to MP3, FLAC or others with this smart DRM audio converter on Mac. 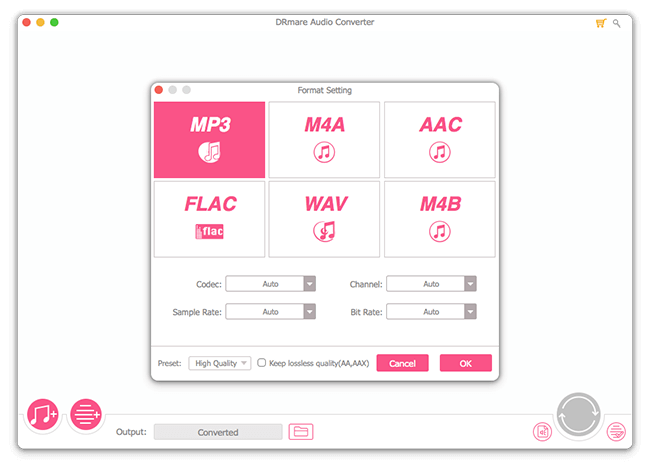 To get started, you should be aware of the proper button to add the right digital audio files to DRmare Audio Converter for Mac. If you are converting protected audios like Apple Music or iTunes or Audible books, then you need to click the first Add button listed at bottom left corner to import the files from the iTunes library. To convert common audios, simply click the second Add button next to it. There is no quantity limitation, meaning you can import as many files as you want to convert in batch. Note: If your audio files are downloaded from iTunes or Apple Music, please make sure you have authorized your Ma to play them on iTunes. Othewise they may not be converted. Next, you can do some settings to make the output files fit your requirements better. Just click the 'format' icon besides Convert button to select output format as MP3, AAC, FLAC, WAV, M4A or M4B and change the codec, sample rate, bit rate, channel and so on. Further more, you can edit the ID3 tag info, volume, pitch, speed as well as split some big files to small segments. For instance, if you are converting Audible audio books, you can split them by chapters. After that, you can click the 'Convert' button to start converting the audio files to the new ones in bulk. The DRM copyright protection will be unlocked automatically during conversion. 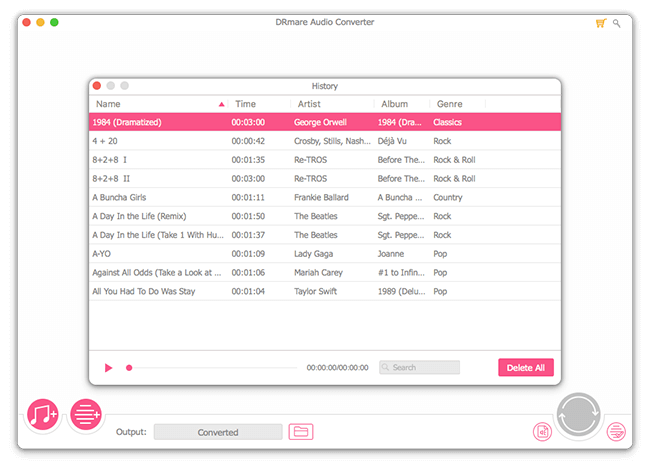 What worth to mention is that DRmare DRM Audio Converter for Mac can keep the original quality with up to 10X faster all according to the number of tracks you are converting. Finally, you can click the 'history' button to locate the converted songs or audiobooks from the folder you defined before. Then you can enjoy them from any device such as burnning to CD, playing on MP3 Player, transferring to mobile devices or sharing them online.